Welcome to the Peoria Park District’s Rock Island Greenway webpage. 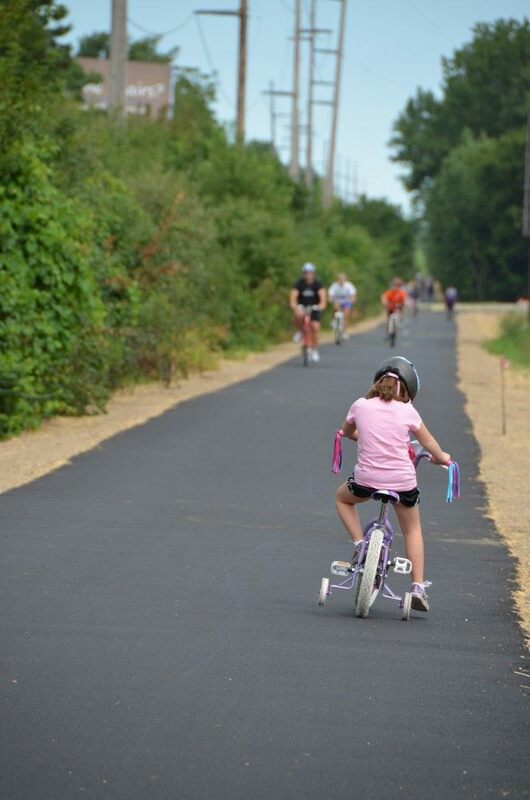 This page is our attempt to keep you up to date as to what is happening with the trail as we continue with our efforts to convert the Kellar Branch Line into the backbone of Peoria’s bike trail system. Bridge and Trail are open! Thanks for your patience! August 19, 2014: I’ve gotten several requests for information on the Allen Road construction project and its effects on the trail. This project is being run by the Illinois Department of Transportation, and peripherally the City of Peoria. The Park District has no involvement. In fact, IDNR owns the land on both sides of Allen Road that the trail is placed on. The Park District has an easement, or permission from IDNR to pave and maintain the trail in this section, but has no property rights. When the construction is finished, there will be a tunnel (much nicer than the old one under Route 6!) for trail users at this location, with Allen Road passing over the trail. I think everyone can be excited about this prospect as it will be a much, much safer situation for trail users. My information from IDOT is that the trail will be closed the rest of this week, and then re-opened for the rest of the year. Sometime in the spring, the tunnel will be installed, and at that time I would suspect we can expect a month or two closure of the trail. I will post more information as I receive it from IDOT. July 23, 2014: Tomorrow is the big day! Although the bridge has been open to traffic for a bit, we will have an official ribbon-cutting tomorrow for the bridge at 10:30 a.m. Please join us! Even though work on the bridge is winding down, we are still busy on the whole length of the trail. Over the next few weeks we will be installing all new signage along the entire length consisting of mileposts, directional signs, attraction signs, and new rules signs. A new trail map is now available on the maps page of this website. We will also be installing bollards, benches, and bike racks along the length of the trail through the end of the year. July 3, 2014: The Grand Opening for the bridge has been set for July 24th at 10:30 a.m.! Work is continuing finishing up the bridge including welding, touch up painting, shimming railings, etc. The fencing along the trail south of Prospect should be completed in the next few weeks – we had some delays with acquiring materials. We were “excited” recently to discover an old drainage structure near the old Pabst site in the Heights, that is causing some drainage issues next to the trail, so please watch out for wet pavement and safety fencing. We are currently working on landscape plans for the bridge area to be installed this fall. Ameren is due to begin major clearing work along the trail between Candletree and Teton starting July 7. There will be a flagger on the trail, as the clearing equipment can throw debris while working. Please be prepared for short delays on this section of trail. For more information, please see the post from June 9. June 23, 2014: I apologize to everyone who was caught by the bridge closing Sunday. This was my fault as I had not communicated to our police officers that the bridge was open and able to be used by the public. The officer closed off the bridge as he was not sure if it was safe for the public yet. We will be communicating the bridge status to all employees at our Monday morning staff meeting to avoid further confusion. Again, I apologize for the inconvenience. June 19, 2014: The contractor will be removing barricades to allow the public to use the bridge late today or tomorrow. There still is a lot to do however. The contractor will be closing the bridge periodically over the next few weeks to complete punch list work. Please obey the barricades when they are in place as we don’t want any conflicts with the contractor causing injuries! You all have the Park District’s sincere thanks and respect for your work on this project. June 13, 2014: Bridge curbs are complete, touch up painting and pavement caulking is underway. Shoulders were placed on the section from Northmoor to Knoxville. Placement of the approach railing is underway. Staining of the concrete wall panels is also underway as well as taking care of lots of details. The HAWK crossing at Glen Ave. is now operational, but we’re still working on fence issues and signage. Mile marker posts and directional signage have been bid out and ordered and should be here in a month or so. 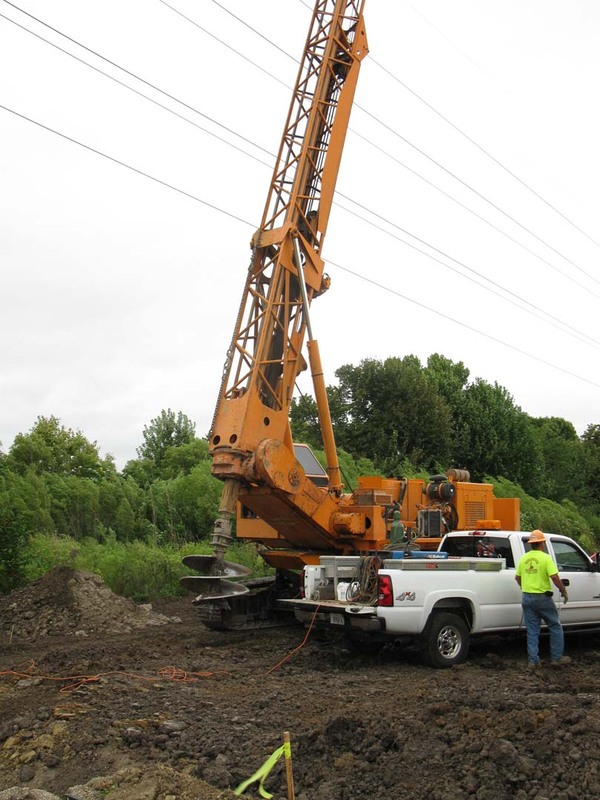 June 9, 2014: Ameren will soon begin major tree and shrub clearing adjacent to the trail as part of their compliance with new federal regulations concerning vegetation management under power transmission lines. You can read more about it at Ameren’s webpage: https://www.ameren.com/Transmission/Pages/Transmission.aspx Please watch out for tree trimming crews and equipment near the trail over the summer. Ameren has easements along the bulk of the trail to access and remove vegetation in virtually the entire area between the pavement and power lines. June 4, 2014: Big day yesterday for the bridge. Both spans had concrete decks poured, and the asphalt approach on both sides has been completed. Concrete staining is underway, and the railings are due to start arriving next week. Still have curbs to pour and storm drainage work to complete. We’ve got some minor delays on the fencing of the Glen to Springdale section, but it looks like that should be sorted out quickly. At this point we are estimating a mid July opening celebration for the bridge, but an exact date will be determined once we are sure the approach railings fabrication and installation is going according to plan. The second page of this brochure shows what to expect at the crossing for both trail users and cars. HAWK crossings typically have the highest compliance by automobile traffic of all pedestrian/bicycle crossing types, and are the current best practice for busy crossings. We hope to be active sometime in the next couple of weeks. May 19, 2014: Half of the East approach was poured last week. Asphalt paving contractor will be on site within the next 10 days or so to work on the stretch of trail from Northmoor to the bridge, the approaches, and the Junction City connection. Gravel shoulder work on the section from Glen to Harvard will begin late this week, and fencing work continues. May 9, 2014: West approach has been poured but we are waiting on the railing to complete. Contractor is working on the east approach reinforcement and formwork. No date set yet for that pour. The fencing work has been continuing on the Glen to Springdale Cemetery section and is almost complete. The contractor is working on placing signage and lots of little details. We have power to the Glen Ave. warning light, but we will not activate it until all of the signage is in place. I’m working on a comprehensive signage program including mile markers and destination signage that we’ll be putting into place in the next few months. April 16, 2014: The west approach will be poured this Friday. The approach pavement actually forms an integral wall cap and curbing, so there is quite a bit of reinforcement required, as well as some involved formwork. The contractor will be using a pumper truck to get the concrete up on top of the approach. If your morning commute uses Knoxville Ave., you will probably see some concrete trucks arriving and departing. March 3, 2014: What a great turnout! Thanks to all of the people who came out to see the bridge pick in the awful cold. It’s great to see such widespread interest and dedication. Both spans went up smoothly with no problems, thanks to exhaustive preparation work by Hein Construction and the skills of their subcontractor Clausen Structures. Of course, I would be remiss if I didn’t also credit a great design by Bryan Swanson and the rest of the engineers and staff at Maurer-Stutz, Inc.. During this miserable winter, they have been the eyes on the ground checking, rechecking, and documenting everything to bring the design on paper to reality on-site. The proof of a great partnership was how smooth everything went together out there. Next up is the completion of the approaches, and the upper piers. February 25, 2014: The schedule has ben firmed up on the bridge lift. 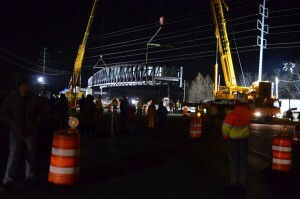 The truss over Knoxville will be set on Thursday the 27th around 10 p.m.. The cranes will begin staging earlier in the afternoon, so there will be some lane closures starting in the afternoon. 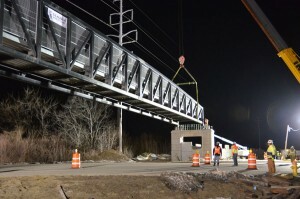 The second span will be set on Friday the 28th around 1 p.m.. If you go out to the site to watch, please stay to the north side of the bridge (Junction City side). Please respect any barricades and construction worker requests for your safety. It is plenty big enough to see from a distance! 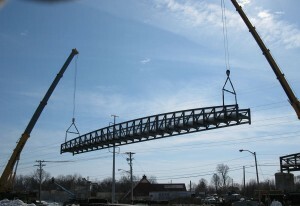 February 17, 2014: Sections of the steel truss have arrived, and more are on the way. It is looking like the contractor will be ready to set the assembled trusses sometime around Feb. 28th through March 2nd. January 29, 2014: Pieces of the steel trusses will begin to arrive in Peoria next week. These will be staged on trailers until all pieces are present and can be spliced together. 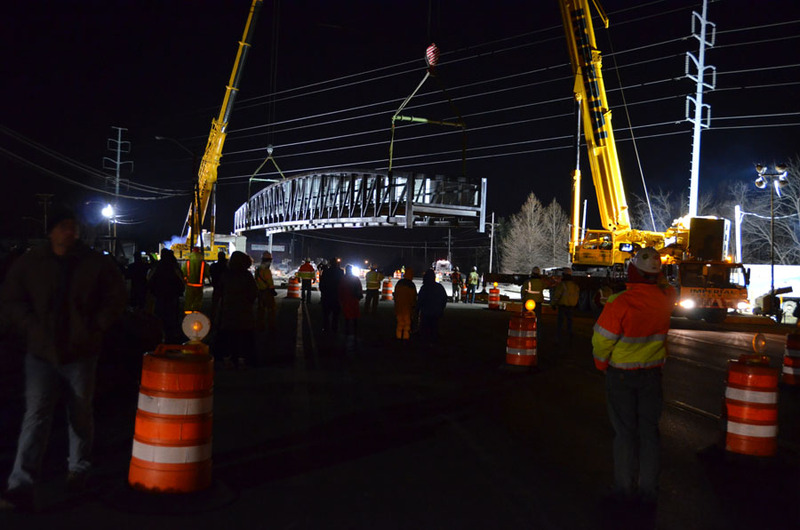 January 22, 2014: Despite the frigid temperatures, there continues to be slow progress on the bridge, with the contractor preparing for the arrival of the steel truss pieces within the next few weeks. The ground heater blankets have allowed concrete and engineered fill work to continue on the west approach. December 16, 2013: Construction is slowing down due to weather, however if temperatures do moderate, expect to see continuing work on fencing. Bridge work will continue with the use of heated blankets to keep the ground and stockpiles thawed. The pace will slow, but all parties want to be ready for when the sections of the bridge truss arrive. November 21, 2013: The Glen to Springdale section paving is complete. Thanks to the contractors Otto Baum and UCM for pushing ahead despite the late start. The fence contractor will be installing nearly a mile of protective fencing along steep slope areas over the next few months. The approach walls are being constructed on the east side of the Knoxville bridge and the east side walls should be completed within a couple of weeks. At that point the contractor will move to the west side of Knoxville. Bridge fabrication drawings have been produced and reviewed, and the actual fabrication at the bridge shop in New York should begin after Thanksgiving. November 8, 2013: The Glen to Springdale section is being paved. The contractor has pretty much finished the section between Glen and Prospect, and is planning on paving through Wednesday of next week. On the bridge, the installation of the precast concrete panels on the piers is proceeding. The first shipment of the precast retaining wall panels has arrived on site, and the contractor is forming up the bases for these walls and will pour the east side next week. October 14, 2013: The Glen to Springdale section of trail is moving quickly. The Prospect Road intersection has seen lots of work on new curbs, ramps, and storm drainage. Additionally, underdrainage has been installed between Prospect and Glen to take care of some wet areas. The precast panels for the bridge piers are due to be installed this week as well. Utility relocations are also in progress on both projects. September 27, 2013: The Glen to Springdale section of trail has started construction! The contractor is working on the Prospect Road intersection, and has bladed off the length of trail to Harvard. We should see lots of activity at the Prospect Road intersection next week as well as new curb ramps and widened walks are constructed. The removal of soft soils has been completed under the bridge approaches. Soon new engineered soil that can handle the weight of the approaches will be delivered and placed. Also, expect to see the bridge piers rise above ground over the next few weeks. The concrete approach walls are being precast off-site. August 23, 2013: The trail section between Glen and Springdale has finally been awarded! Hopefully we can begin construction as soon as possible. Lots and lots of concrete! The foundations varied in depth due to the soil conditions from 28′ to 46′ deep. Eventually, the above-ground piers that support the bridge will be placed on top of these and concreted together. We’ll have a couple weeks now of little activity on-site as the pre-cast concrete walls are cast up off site. August 15, 2013: The bridge contractor has been clearing brush and performing layout while the fiber optic line is relocated. 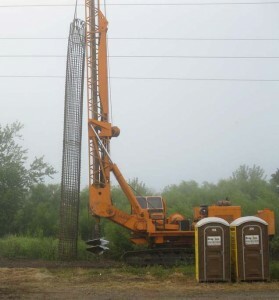 The core drilling for the 37′ 28′-46′ deep underground bridge support piers is tentatively scheduled to begin next week. Unfortunately the State has yet to award the Glen to Springdale section of trail. We are all frustrated and are doing all we can to speed up the process. August 1, 2013: Notice to Proceed has been issued to Hein Construction to begin work on the bridge. Met with some of the utility companies involved today. Contractor is at work securing suppliers for project materials. Looks like on-site work will begin in 2 weeks after a fiber optic cable is relocated. Due to backlogs at all of the major bridge fabricators, our steel truss portion of the bridge will not arrive until January. Our bridge will be fabricated in New York and shipped to the site in sections. July 29, 2013: The contract for the construction of the bridge over Knoxville has been awarded. We should be starting construction sometime in the next few weeks after all of the paperwork is squared away. July 12, 2013: More good news. Bids have been received for the bridge over Knoxville, and they are within budget. The contract will go to the Park Board for approval on July 24, 2013. June 19, 2013: Great news! Bids are back for the trail construction from Glen Ave. to Springdale Cemetery and they are within budget. We are moving ahead with the State process for awarding the contract. Bridge plans went out to bid yesterday and we will receive bids in two weeks. June 6, 2013: Rules signs and Adopt-A-Trail signs have been installed on the finished portions of the trail. Thanks to our Adopt-A-Trail volunteers who will be helping keep their stretch of trail clean! Still waiting on bridge comments/revisions from IDOT, but we’re finally getting close to our letting date for the Glen to Springdale Cemetery section on June 14. May 22, 2013: If you are curious about what an IDOT approved bike trail plan set looks like, here is a link:http://eplan.dot.il.gov/desenv/061413/89639-227/PLANS/PL-89639-227.pdf . Its about 15MB. You can also view the specifications, which are another 200 pages. Keep your fingers crossed for competitive bids! May 13, 2013: Bridge plans were submitted last week to IDOT for review. Hopefully we will have them back and approved in a month. The trail section from Glen to Springdale Cemetery is now officially out to bid, and plans can be downloaded at IDOT’s website within the next couple of days. 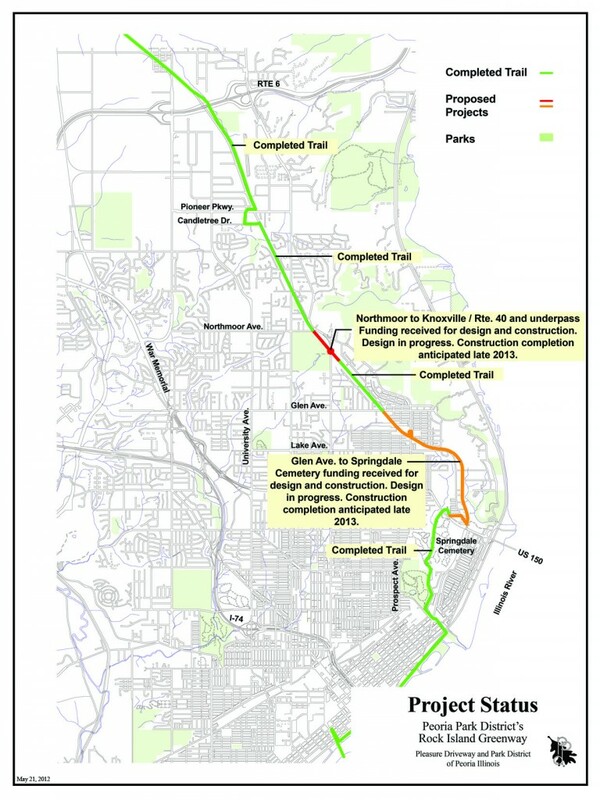 April 16, 2013: The final plans for the trail section from Glen Ave. to Springdale Cemetery have been submitted to IDOT for the June 14, 2013 State bid letting. This means the plans will go out to bid in May, bids will be received on June 14, and we will be under construction in late July or early August! Bridge plans are also nearing completion, and we expect them to go out to bid in roughly the same time frame. October 30, 2012: After engineering work, utility locates, and consulations with IDOT and various utility companies, the Park District has decided to utilize a bridge to cross Knoxville Ave. instead of an underpass. The relocation of so many utilities (fiber optic, water, gas, electricity, and sanitary sewer) would be possible, but would require over a years worth of delays and cost an immense amount of money. 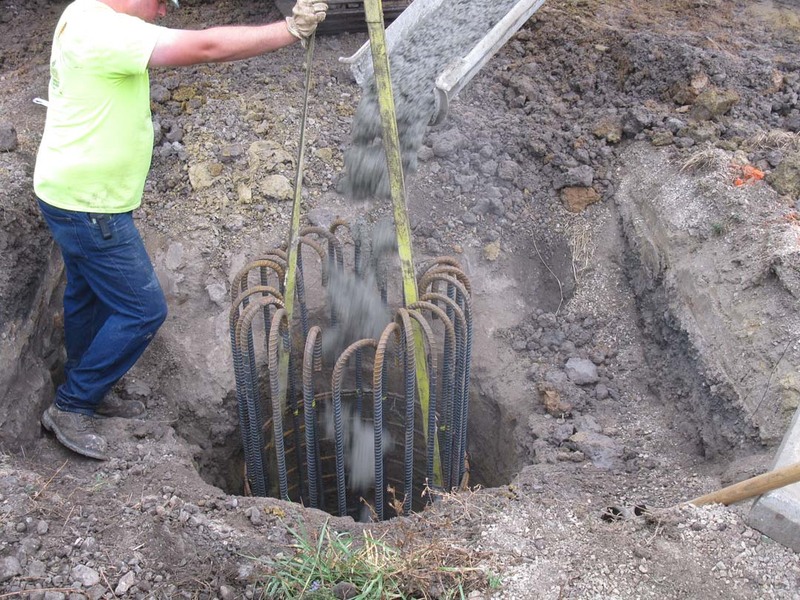 Of special concern were 3 water mains 12″ through 24″ diameter (some over 50 years old serving large portions of north Peoria) that would have required significant excavations and engineering to relocate. The good news is the engineers feel that our construction schedule will not be affected, and we are still on track for a summer 2013 construction period. August 21, 2012: Donation opportunities are available for bike trail enhancements such as tables, benches, water fountains and bike tracks. Please look farther down the page for details and links. July 26, 2012: Design meetings are continuing for the underpass and Glen to Springdale sections. It looks like the underpass will be constructed 1/2 at a time, but the utilities and their relocation seem to be the trickiest part of the equation. IDOT and our engineers are preparing the plans for moving lanes of traffic during construction – first out of the way to build one half, then over the newly constructed half of tunnel while we complete the other side, then back to normal. Tree clearing and utility locates are completed for the temporary connection at Junction City. Hopefully this will be paved in the next week or two. 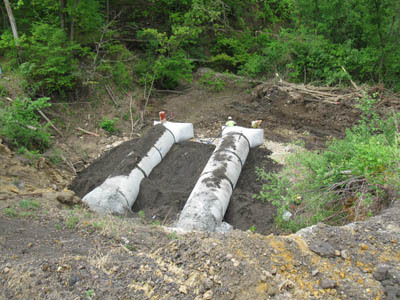 July 13, 2012: Design is continuing on the sections from Glen to Springdale Cemetery, as well as the Knoxville underpass. 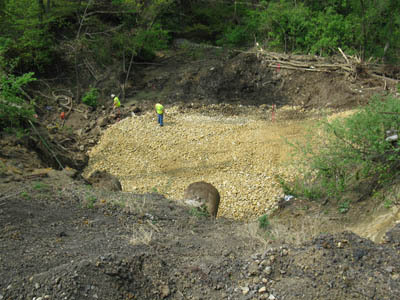 South of Glen, design work continues on solutions to some of the troubling erosion areas. 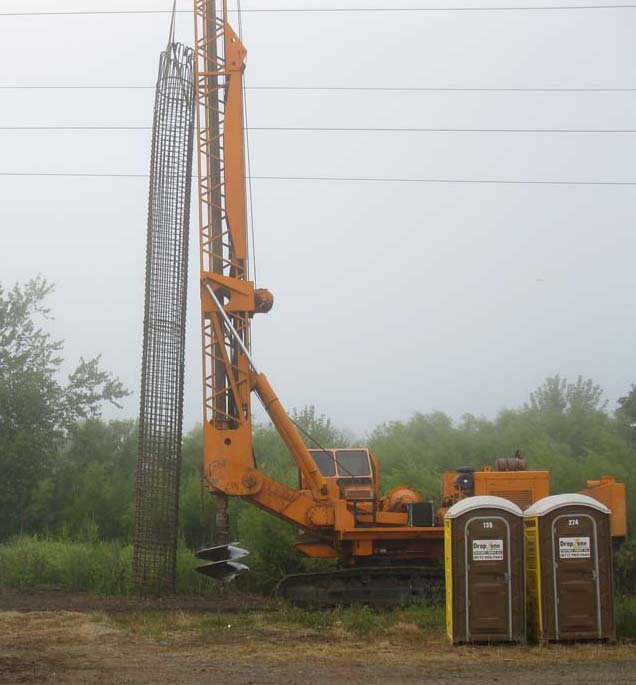 The subsurface utility investigation at Knoxville is (hopefully!) complete, and plans continue on how to relocate the underground gas, water, and fiber optic utilities that are in the way. The Park District and engineers will be meeting with IDOT in the next couple of weeks to discuss exactly how we’re going to keep the Knoxville traffic flowing while we construct the underpass. Should be interesting! 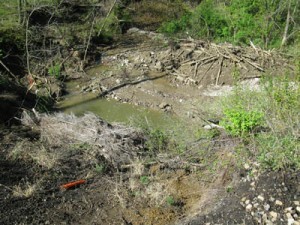 May 29, 2012: Due to some poor seed germination, last week the slope over the culverts was hydroseeded. Please excuse the patches of green mulch that were inadvertantly blown on to the trail during the seeding. Hopefully this seeding takes, and we can make sure that slope is stabilized. May 18, 2012: The trail was officially named at the May 9, 2012 Board Meeting. The portion of trail under Park District ownership from Alta to the Bob Michel Bridge will be named the Peoria Park District’s Rock Island Greenway. A new logo is under development by our Marketing Division. Currently, the underpass design work is focussing on the underground utilities around and under Knoxville Ave., and design is continuing on the Glen to Springdale section of trail. March 9, 2012: Apologies for the lack of updates, but despite that, lots of things have been happening in the background. Great news – the Knoxville underpass has been funded! Design is underway on the underpass. Because Knoxville is a State highway, design will require multiple reviews by IDOT, so this will be a slow process. Design is also underway on the section of trail from Glen to Springdale Cemetery. Surveyors have been out pinpointing areas with poor drainage and steep slopes. Also, the tie removal contractor has finally finished their work. We hope to be out to bid on both the underpass and the Glen to Springdale Cemetery segments by year end. Finally, we have received a temporary easement from our friends at Junction City and US Cellular that will allow a temporary trail connection until construction on the underpass is complete. We hope to start paving that as soon as the asphalt plants open. September 21, 2011: The rails have been removed from Teton, and the pavement patched. Punch-list work continues. August 15, 2011: Candletree to Northmoor is paved! Seeding is down and mulched. July 27, 2011: Traffic signal work at Giles/Sheridan for new pedestrian buttons/lights. Prime coating (liquid asphalt) of the gravel base has begun, which means paving is just around the corner- possibly as soon as Friday, but more likely next week. July 15, 2011: Pavement base being placed between Giles/ Sheridan and Northmoor. Things are moving fast with the dry weather! New culverts in place at Giles/Sheridan. 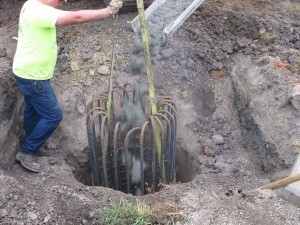 July 6, 2011: New curb and concrete work at the Giles/Sheridan crossing is underway. Grading underway between Teton and Giles. Still backfilling over the large culverts. This rock monstrosity at the end of the culverts is called a “stilling basin” which is designed to slow the flow of water and dissipate energy, hopefully preventing future erosion problems. Now we just have to fill another 40′ to the trail! June 7, 2011: Finally some dry days! 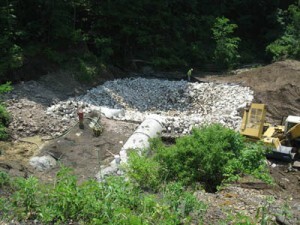 Stilling basin almost complete, large culverts are finished, and backfill has begun. Trailside ditches under construction north of Teton Dr.
May 20, 2011: Candletree to Northmoor: Tree clearing almost complete. Culvert and erosion repair behind Versailles Gardens underway – culverts in place, stilling basin under construction. May 10, 2011: Bike Trail page is up and running! Check back often for current information! The bike trail project has taken nearly 30 years from the first construction on the riverfront until today. Due to increases in costs of materials, labor, equipment, and fuel, the trail project was then divided into different sections and phases, and additional funding sought to complete each discrete section. Project is in final review. We estimate it will be ready for bidding by July 2013. Section is out to bid, construction in summer 2013. Why is it taking so long to build? It’s just a bike trail! The bulk of the trail construction funding comes from federal transportation bills. The Illinois Department of Transportation administers the money, and has design and construction oversight. Because of the federal restrictions, the bike trail is designed and built just like a narrow highway to assure that the taxpayers get a long-lasting, properly designed trail. This oversight brings a lot of review time, and construction is handled via state letting like a road project. This takes quite a bit of time. Why does the trail stop before it gets to Knoxville? Until the crossing of Knoxville is completed, there will be a temporary routing to allow a crossing of Knoxville at Northmoor Avenue. This summer (2011), with the cooperation of our friends at Junction City, a temporary trail will be paved from the trailbed over to Humboldt and Prospect, where the sidewalk on the east side of Knoxville can be accessed to take users to the crossing at Northmoor. Can I Rollerblade on the Trail? How about my Segway? Rollerblades, strollers, bikes, wheelchairs (both manual and electric) and children’s non-motorized scooters are allowed. Skateboards, motorized bikes, golf carts, go-karts, minibikes, Segways, motorcycles and ATV’s are not allowed. The Peoria Park Board will be formalizing these rules at a later date and may allow or disallow these or other transportation methods at that time. What is the trail’s actual name? The Peoria Park District Rock Island Greenway. The Peoria Park District Police will be patrolling the trail on foot, bike, and horse. Emergency vehicle access is possible at each road intersection. Of course, the Park District reminds everyone that when walking or jogginganywhere, your own awareness and common sense remain the best safety factor of all. If you spot illegal or suspicious activity please call 911 and the closest available officer, from the Park District, City, or Village police forces will be dispatched. The Park District Police can be reached at 673-4521, or if you’d like to leave a message you can call 686-3359. Wow, this trail is really nice! Who do I thank for doing such a fabulous job? Thank the Park Board for remaining committed to the trail and setting aside the money for its construction through some really difficult times. Such long term commitment by elected officials is rare. We also need to thank dedicated volunteer groups that have assisted the Park District for years by conducting cleanups and public awareness campaigns. I’m a neighbor and I have personal items or landscaping on the right-of-way. Can I leave them? There are several legal factors involved in this question. The City of Peoria and Village of Peoria Heights retain ownership of the land. The Park District has an easement to construct and maintain the bike trail on that land. So in simple terms, if your stuff is in the way of construction of the bike trail and its associated drainage, then you will need to move it, or it will be disposed of. If your items are NOT in the way of trail construction, then that question needs to be addressed to either the City or Village depending on where you live. Regardless, the entire Kellar Branch has been railbanked, which gives it federal protection should a railroad wish to come in at a future date and rebuild. Just because your stuff is there and has been for some time, does not mean the property it sits on is yours. I see lots of areas where water is ponding along the trail. When are you going to fix that? As trail construction has begun, the dismal condition of the Kellar Branch has become more evident. Obviously, little or no maintenance has been performed on the Branch since the 1950’s when the Rock Island railroad was undergoing severe financial difficulties resulting in its bankruptcy. We have also documented numerous cases of landscape waste being dumped within the ROW. Leaves, tree limbs, and grass clippings can all have a negative effect on the existing drainageways, especially when storms wash that debris into culverts and clog them. The Park District urges all of its neighbors to please dispose of their landscape waste on their own property- Try composting! Its great for your garden! The Park District will be performing grading and drainage work associated with trail construction to assure the trail drains correctly. Remember, the trail construction will not be changing existing drainage patterns (except around the bridge). Areas that have drained slowly in the past will probably always drain slowly. The Park District is not responsible for mistakes made during the development or renovation of private homes and yards. There’s still garbage and railroad tie pieces out here! How do I get it cleaned up? The Kellar has been a dumping ground for over a century, so obviously the Park District will not be able to clean everything up right away. The District looks at this as a long term project, and it may be several years before everything is beautiful and park-like. There are several user groups that are continuing to organize cleanups and “adopt-a-mile” programs for the trail. If you are interested, I would urge you to seek them out. Every little bit helps! I’m a neighbor and I want a chain link fence to limit access, or landscape screening. Who do I talk to? The Park District is asking that neighbors of the trail give the trail a full season after opening in order to see the true use patterns emerge. If after a season of trail use, you still feel you have access issues or need landscape screening, then the Park District is committed to meet with each neighbor individually to discuss possible solutions. Of course, this is not a one-time deal! If in the future, a use pattern emerges that needs to be addressed, we would be happy to come out and meet with you and work out solutions. I’m a neighbor and I want to make a path from my property to the trail. Can I? Yes, we encourage it! We want our neighbors to love the trail! This is a very common occurrence in other cities where urban bike trails have been added. In many cities, neighbors have made new front yards out of their back yards and have quite grand entrances complete with bike racks for visiting friends. When you do however, be sure you do not fill in any drainage ditches, or you may cause serious problems for yourself or your neighbors during storm events. 1984 City of Peoria and Village of Peoria Heights purchase the Kellar Branch from the Trustees of the bankrupt Chicago, Rock Island, and Pacific Railroad. City attempts to continue service to Pioneer Industrial Park businesses. 1993 Rail service down to two users. City asks for Park District assistance in acquiring grants to build trail on rail line.